Dubbed the ‘Amazon of the seas’ the Philippines is regarded as the world epicentre for marine biodiversity. Approximately 200 species of sharks and rays exists in the country’s waters, ranking it amongst the highest in the world in terms of diversity. This diversity also means it has an incredible amount to lose from the pressures facing the world’s oceans: habitat destruction, overfishing, plastic pollution, and irresponsible tourism. Fortunately, this study by LAMAVE, TMO and MMF shows that well-managed and enforced marine protected areas like Tubbataha Reefs Natural Park can be lifelines for species like reef sharks that are rapidly disappearing from coastlines around the world. Tubbataha Reefs Natural Park was declared a UNESCO World Heritage Site in 1993 and is the largest no-take marine protected area in the Philippines covering an area of 1000 km 2. While preliminary assessments for sharks in TRNP in 2005 and 2010 demonstrated high abundances of whitetip reef sharks, the goal of this study was to conduct a comprehensive assessment of all shark and ray species in the park using a combination of Underwater Visual Surveys (UVS) and Baited Remote Underwater Video Surveys (BRUVS). Underwater visual surveys were conducted by a team of scuba divers in various sites around the park in 2015 and 2016. Two spotters and one recorder dived along the reef at a constant depth of 15 m recording shark sightings over a known distance. Contrastingly, the Baited Remote Underwater Video Surveys (BRUVS) allowed the team to assess the abundance and diversity of sharks and rays at a wider range of depths from 1-100 m. The BRUV surveys also contributed to the worldwide assessment of sharks under the Global Fin Print Project. Both UVS and BRUVS reported some of the highest abundances of grey reef sharks and whitetip reef sharks known worldwide. 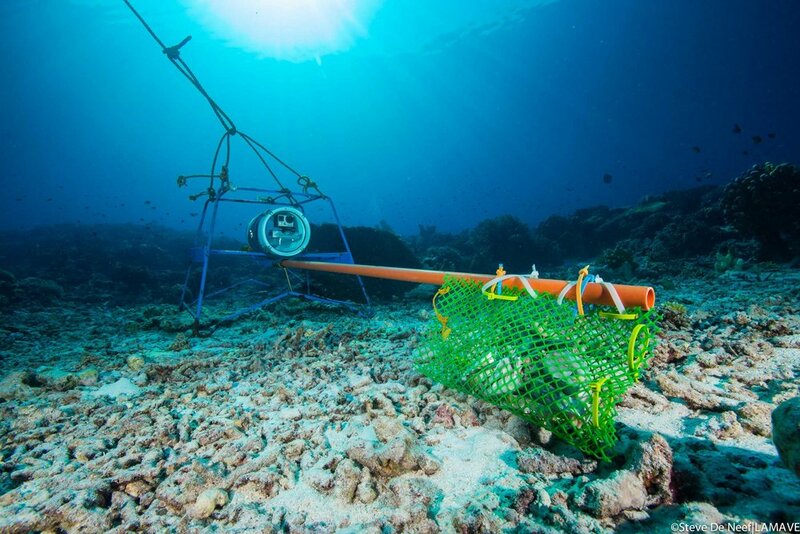 In fact, reef shark densities found during UVS were three times higher than in no take zones (off limits to fishing) in the Great Barrier Reef (Australia) and nearly twice those found in Cocos Keeling, Australia. In total, the surveys documented 15 species of shark and ray within the park including, but not limited to: tiger shark, whale shark, tawny nurse shark, grey reef shark, whitetip shark, silky shark, scalloped hammerhead and spotted eagle ray. Photo 6. An aerial shot of the South Atoll in TRNP, which is located approximately 170 km east of Puerto Princesa. Credit: Simon Pierce|LAMAVE. Why are sharks thriving in Tubbataha Reefs? The team believes there are a number of reasons why reef sharks are doing so well. The park is incredibly well managed and enforced, an attribute to the fantastic staff of the Tubbataha Management Office and the Rangers of Tubbataha Reefs. Secondly, the park has been protected since the 1980s enabling multiple generations of sharks to mature and reproduce without fishing pressure (reef sharks become sexually mature around 10 years of age). Finally, the size of the park (1000 km2) and its isolation from human populated areas has allowed the marine habitat to thrive in a natural state. There are clearly lessons to be learnt from the success of Tubbataha Reefs Natural Park that can be applied to the development of future marine protected areas. The team hopes that this exciting news highlights the success of the park for reef sharks and will provide hope and inspiration to others in the fight to protect the oceans. Photo 7. The rangers of Tubbataha Reefs. The rangers who protect the park are composed of members of the Tubbataha Management Office, Philippine Navy, Philippine Coastguard and members of the Local Government Unit of Cagayancillo. Photo 1. 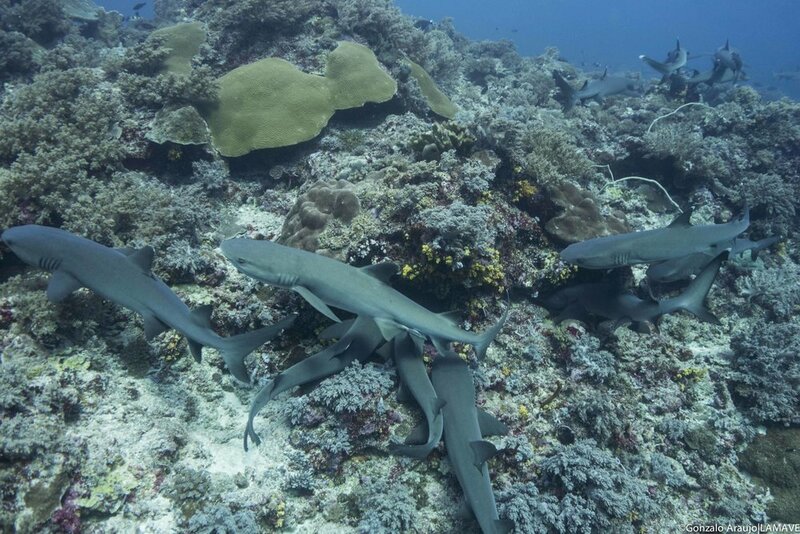 Juvenile grey reef sharks photographed in Tubbataha Reefs Natural Park. Credit: Gonzalo Araujo|LAMAVE. A PDF version of the Press Release can be downloaded HERE. If you would like more information about this topic, please contact Sally Snow: s.snow (at) lamave.org. Photos and video are available upon request.